The Sega Mega Drive (メガドライブ, Mega Doraibu) was a 16-bit video game console released by Sega in Japan in 1988, and North America in 1989. Europe and most of the rest of the world saw the release in 1990. It debuted under the name Sega Genesis in North America, as Sega was unable to secure legal rights to the Mega Drive name in that region. It was the direct competitor of the Super Famicom (Super Nintendo), although the Sega Mega Drive was released two years earlier. 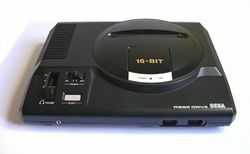 An additional version of the Sega Mega Drive was created by Majesco to re-release the console (noted by its similarities to the SNES), however it was superseded by a third version that was released in 1998, after Sega had discontinued support of the original console. The Sega Nomad was a portable version of the Sega Genesis. It was capable of running all Sega Genesis games and had a full color screen. The Sega Mega Jet was first commercially rented out in some Japan Airlines. It was later released only in Japan. It played Sega Genesis games, and was the basis of the Sega Nomad. It was released March 10, 1994 at the cost of US$123. Pages in category "Sega Genesis"
This page was last edited on 26 April 2015, at 01:58.